Screen scallops offer improved performance and increased economy in a radial flow process. Screen scallops offer improved performance and increased economy in a radial flow process. Refiners save time and money because the scallops are durable, easy to install and simple to maintain. Manufactured with welded wires and rods, Johnson screen scallops are resistant to bending, twisting and collapsing. It's these qualities that allow the scallop to tolerate the extreme loads produced by expansion in temperature cycling operations. Furthermore, buckling and damage caused during installation are virtually eliminated. Maintenance of the scallops is easy. System performance should also benefit from a screen scallop. Abrasion of the catalyst during bed movement is prevented by the vertical orientation of the slots. Also, the high open area translates directly into reduced pressure drop and enhanced process efficiency. 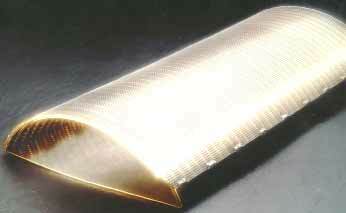 Johnson screen scallops are available in various sizes and materials. Typically made of 304, 316, 316L and 409 stainless steels, other materials are available depending on process requirements. USF Filtration & Separations, P.O. Box 64118, St. Paul, MN 55164. Tel: 651-639-3159. Fax: 651-638-3140.